Taste so yummy…and oh so good for you, too! These are so tasty you won’t believe you’re eating healthy! You may think nothing this good for you should taste so good...or be this easy to cook. But think again! Not only are sweet potatoes sweet to your taste buds, but they’re also good for your cardiovascular health. They’re low on the Glycemic Index and are slowly released in your blood. This starchy root vegetable is a rich source of flavonoid anti-oxidants, vitamins, minerals, and dietary fiber that are essential for optimal health. Low in calories, zero fat, zero cholesterol! This recipe below makes 6 servings. • Preheat the oven to 425 degrees F (220 degrees C). • Place strips in a plastic bag (preferably a zip-lock bag), add olive oil, Italian seasoning mix, cayenne pepper, sea salt, and fresh ground pepper. • Close and shake the bag until every piece is evenly coated. • Spread the strips out in single layers on two large baking sheets. • Bake for 20-30 minutes, or until crispy and brown on the outside and tender inside. Thinner strips may not take as long. Make sure to turn the fries over every 10 minutes while baking. These healthy sweet potato fries are delicious no matter how you eat them. Try them plain, or dip in honey mustard sauce, ketchup, or even a little organic Greek yogurt with curry powder and a splash of hot sauce. I like mine with a little spicy salsa, or sometimes just with ketchup mixed with Sriracha chili sauce. Hmmm…yumm! What is the difference between “Fitness” and “Wellness”? A person who is fit may not necessarily be healthy, and a person who is healthy may not necessarily be fit. "Health" covers a wide array of components which are usually under the umbrella word, "wellness." "Wellness," in essence, covers all areas of health: mental health, emotional health, physical health, spiritual health, social health, relationship health, and so on. Basically, these are all the different components in a person's life that can affect their overall "well-being." So when it comes to "fitness"... a person may be fit — be active, participate in sports, be able to lift weights, change the shape of their body, run, jump, and increase their cardiovascular capacity — but this does NOT mean that the state of their body, or their overall "well-being," is in good health. The movement and oxygen produced from "fitness-type" activities can hugely benefit the well-being of the body, BUT it is NOT the only factor that determines the overall health — the "wellness" — of the person. So for example: If a person is always in a state of negatives thoughts or feeling negative emotions (due to an unhealthy relationship with the Self or with others); or if a person regularly eats highly acidic foods, or doesn't eat balanced meals with proper nutrients; or even if he/she doesn’t learn how to breathe deeply, stretch properly or meditate to quiet the mind, this will all affect the overall "wellness" of that person. This is why "wellness," not just fitness, is so important. Wellness is the state of health, state of balance, if you will, in not just your physical body, but also your energy body (in other words, your spirit), your mind (the way you think and how it affects your life), and your emotions (the way you understand them, feel them and use them as guides). So essentially, "wellness" covers the overall "well-being" or "health of a being" from mind, body to spirit. And this makes "fitness" only a component of wellness: it is only a part of the whole. So don't be only concern with fitness. If you want an overall healthy, happy, balanced life, you have to put your attention and appreciation towards all the other components of health in your life. Gift yourself all aspects of what "wellness" has to offer. Feel free to visit Wellness With Penny.com to get some ideas. Check out the different pages from Life and Relationships, Food and Fitness, Thought for Today, to Laugh out Loud! Use this site as a guide to further help you explore the wonderful world of wellness. Let it lead you where it may... To your wellness! Join the Wellness Movement! Start here, right now, with this 10-Minute Home Workout Series 3: Four-tified. **Click here if you missed the 10-Minute Home Workout Series 2: Back to Basics. What would you like to see unfold in your life? This weekend marks the 10th anniversary of the tragic events of 9/11. The Chopra Center would like to honor the many heroes who on that day gave their lives to save others. To all the rescue workers, volunteers, the New York City Fire Department, the passengers on Flight 93 who bravely fought their captors, and the countless unnamed people who offered love and comfort in the face of unspeakable violence - our gratitude is overwhelming. To all of those who lived and kept going after losing husbands, wives, children, parents, friends, co-workers, our hearts are filled with compassion. And to our military servicemen and women who continue to dedicate their lives to protecting and expanding freedom throughout the world, we offer our deepest thanks. As we take time this weekend to consider what 9/11 has meant to us both individually and collectively, we invite you to also consider what you wish to see unfold in the next ten years. Chopra center co-founder, Dr. David Simon has created a beautiful intention-setting meditation that will help you connect with your heart and put your attention on what you'd like to see blossom in your life and on the planet. As he has written, "The greatest contribution we can make to the wellbeing of those in our lives is to have peace in our own hearts. Our state of being broadcasts expansion or contraction to every sentient creature within our midst. When our hearts are filled with gratitude and our minds are brimming with enthusiasm, everyone we encounter leaves our space feeling a little bit lighter than when they entered it." Numerous studies have shown that eating oatmeal can help lower cholesterol and reduce the risk of heart disease. The abundance of soluble fiber in oats helps remove LDL or "bad" cholesterol, while maintaining the good cholesterol that your body needs. The soluble fiber in oatmeal absorbs a considerable amount of water, which significantly slows down your digestive process making you feel full longer. Therefore, oatmeal can help you control your weight (if that is a concern). New research also suggests that eating oatmeal can reduce the risk for type-2 diabetes. In fact, the American Diabetes Association already recommends that people with diabetes eat grains like oats. The soluble fiber in these foods helps to control blood glucose levels, reducing the spike in blood sugar, which helps squash love-handle cravings. Moreover, those who go to the gym after breakfast should take heed of several studies reporting that consuming low-glycemic foods such as oats before exercise increases your body’s fat-burning capabilities while sweating it out. Try to stick with the plain, old-fashioned oats to avoid the onslaught of sugars and sodium that may be found in flavored instant varieties. If you look at the ingredients on a box or bag of rolled oats, you'll usually see only one ingredient...rolled oats. So avoid any other added ingredients such as artificial colors, flavors, sodium or preservatives. 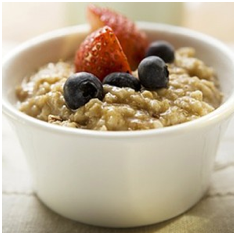 Oatmeal contains a good source of fiber, protein, complex carbohydrates and iron. The fiber and other nutrients found in oatmeal may also reduce the risk for certain cancers. Oatmeal can be absolutely delicious! Add some fruits or a little raw honey, sprinkle some cinnamon or dry cereal, add hempseed or flaxseed or whatever else that’s good for you. The combination of flavors you can fit into a serving of oatmeal is limited only by the imagination. **Look at the picture here to the left and you'll see that I like to add some almond milk, decorate with some cantaloupe, and sprinkle some Kashi brand cereal (the Honey Almond Flax whole grain flavor) for more nutrients with some sweetness. Yummy! It's like a healthy dessert I look forward to every morning. Whatever the case, I like to have my Matcha green tea as well. If you don't already know the powerful benefits of drinking Matcha green tea, please click here to learn.